NPR or National Public Radio, is something I never thought I would get into. As a young boy, I remember NPR being broadcast from my mother’s portable radio daily. It was this droning voice talking about things I didn’t understand. It felt like an extension of the television programs my parents would watch every night, like “Washington Week In Review,” “The McNeil/Leher Report” and “Frontline.” The people on these shows seemed so plain and boring. Everyone looked like my father and mother and and their academic friends. These were the people I saw in real life. Why would I want to watch them on TV? Hard rock and heavy metal music was the opposite of everything that public broadcasting represented to me. When it came into my life, it provided an escape from everything that being a young child of much older, ultra serious academics entailed: was an open ticket into a world of fantasy, excitement and intensity. I was determined to make this world my life. If I could do that, I might never have to watch another public television news program or listen to NPR. Thankfully, that all changed a few years later, when I realized that Public Broadcasting had a place for me too. It started when I discovered shows shows like Austin City Limits and Live At Lincoln Center (the ones which were never on in our house). These shows appealed to my expanding musical tastes and fed me musical inspiration. I even developed a taste for some of the news programs, finding them a refreshing alternative to the commercially driven frenzy of cable news and the major networks. It helped that I was getting older and some of the broadcasters were getting younger. It was no longer just my parents’ world. The story was entitled ‘Jazz Covers Rock: The New Standards.’ To be mentioned on NPR, along with these top jazz artists, including one of my favorite pianists and biggest inspirations, Brad Mehldau, was beyond an honor. As turned out, the month before, we had been on the road with Judas Priest, the original artists who had recorded ‘Electric Eye,’ the song mentioned. I had given KK Downing, one of Judas Priest’s guitarists, a copy of our CD and we had kept in touch and he had recently e-mailed to tell me how much he enjoyed it. It was a pleasure to be able to write back and send him a link to the NPR story. In addition to ‘Take 5: A Weekly Jazz Sampler,’ I love reading Carrie Brownstein’s blog: Monitor Mix. In this week’s post, I couldn’t agree with her more about how the internet is turning a lot of us into ‘musical tourists’ and tourism is “the laziest form of experienced because it is spoonfed and sold to us.” Brilliant quote. More of us need to ‘show up.’ Go to the concerts, own the albums (not just download or burn tracks) and experience it on a deeper level. I also really liked her blog on 80’s music. “Was it really all that bad?” She’s coming from more of an indy rock perspective, but I would argue the same defense of the 80’s from a hard rock point of view. The 80’s gave us some of Iron Maiden and Judas Priest’s finest work, along with that of Metallica (pre 90’s), Van Halen (classic line up) and of course, Ozzy with Randy Rhoads. In the more mainstream department there was Peter Gabriel, The Police, Simple Minds, Run DMC and other great stuff (yes, I’ve always liked certain pop/mainstream artists as well, surprise, surprise). I had a similar experience growing up – I would be leaving for the evening just as my parents were settling in to watch “Washington Week in Review” on PBS and I couldn’t imagine ever being boring enough to spend my Fridays watching politics rehashed. Now, of course, Gwen Ifill and her panel of reporters are often a source of conversation at my house. And “talk radio?” Or, God forbid, classical music? I contemplated jumping out of the car more than once on trips with my parents. Now, on my way to school in the mornings I listen to the news on the local NPR station and inevitably, once the day starts, someone pokes their head into my classroom with “Hey, did you hear…?” and we begin a Morning Edition roundup. I am turning into my mother. But, and this is obviously just my opinion, we have become a sound byte culture, and the internet fuels that. We seem to want our information in small snippets that don’t require much thought. (C’mon – what can you really say with 140 characters?) We do expect to be “spoonfed” and when something requires too much effort, all we have to do is click and move on to something simpler. Many of my students’ (all “Digital Natives”) writing abilities reflect this: they are great at composing text message-length blurbs, but expanding or expounding on ideas becomes tortuous. Too often, information sources such as NPR (thinking usually required) get shunted to the background in favor of more benign and transitory suppliers. So here’s what I’m concerned about – will my students mature into information consumers, as we did, who rely on and seek out sources such as NPR? Or will that prove to be too difficult, given that they have grown up with the internet and the often “dumbed down” expectations found there? at how intelligent he was. Unfortunatly even NPR censors news. 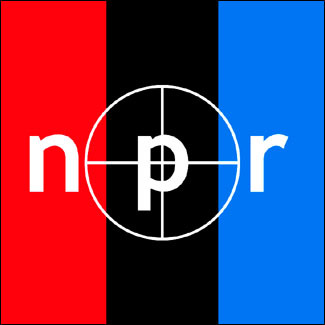 love love love NPR– that IS my source, for most news, and I wake up to it– Love the JAZZ and love the whole–web site ! Recently while going up to snowboard on Mt.Shasta, my 13 yr old son and I listened to " wait wait, dont tell me" He loved it! WE laughed and listened as we drove through the rustic mountaints, & back roads out the the park, a quaint beginning to a wonderful day. Just last night Nol said to me, "set my radio so I can hear that funny program" too bad its only on Saturdays… My earliest memory of my grandfather, is the waking up to NPR out of Hayward everyday LOUD!, I remember that familir voice , of "A Prairie Home Companion" with Garrison Keillor in the morning, and it still comforts me to this day; Sadly Garrison was the way I first heard the description of the twin towers, his voice made it even more surreal. On a better note you can do some fun searches and you never know who will show up on that show, I will surely look up the Skolnick Trio show. Cool. Way to go guys! Make your own news! I actually, gasp, found myself watching NOVA on PBS a week or so ago. I used to only watch that show only if it was pertinent to a class I was taking now I feel I’ve arrived to the adult stage of my life whether I like it or not. I have a lot of memories, like Liz Digital has, of listening to Garrison Keillor with my aunt. I even saw his movie about a year ago. I now find him as a fun sort of guy. I’m glad I’ve finally matured to like all different kinds of things; it’s happened without my even noticing it. NPR, PRI, and PBS are just about all I listen to/ watch anymore. I, too, have been forcing my son to do the same 😉 I never realized how much it was sinking in though, until a few years ago when he was asked to do an improv “news skit” for the VBS at church. He starts off, “Jim Lehrer is off tonight…”, at the ripe old age of 9. Too funny. Still, he gets rounded out by going to see the TSO with me every year. I’ll have to tell him that you’re a fan of the geeky stuff, too.